What to write to the man who made it possible to safe my own life (more than) a couple of times and my mams life from leukemia?? That’s not counting the odd ones that had cold chronic infections etc for decades. My parents are now traveling with a camper in Africa(!) for six months. They are close to 80. They both could have been death already … slowly but steadily . But now they still climb volcano’s and such. Of course they had tens or hundreds of hours spooky treatments. If something doesn’t bother you, one might live longer with more energy and can handle more temporary infections. Superfluously to say that they are traveling with a spooky kit ;-p.
I hear the odd spooky anecdote once every few weeks from them…being bitten by something, some infection and how it disappears after my fathers not so subtle treatments etc. And obviously they are going the need “some” spooky ” maintenance” afterwards. I wouldn’t go there anymore. But they can and they are. Collecting stuff that isn’t even tested for over here. 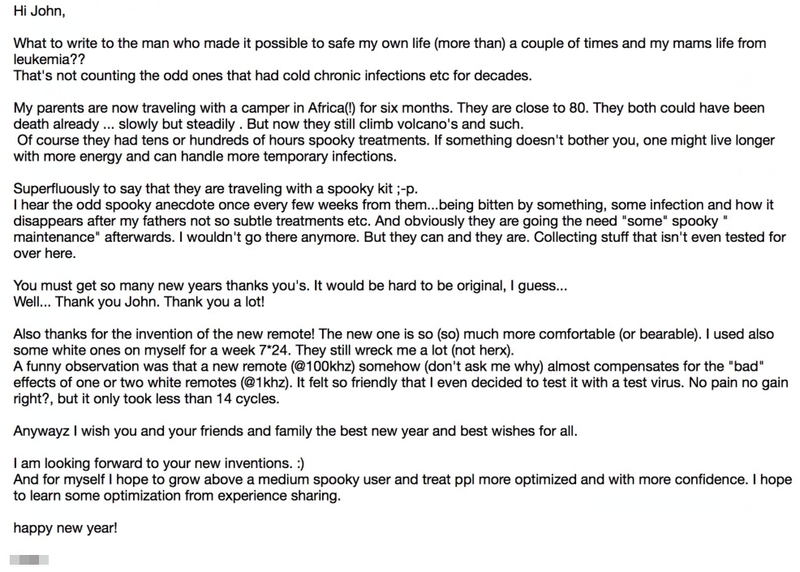 Well… Thank you John. Thank you a lot! Also thanks for the invention of the new remote! The new one is so (so) much more comfortable (or bearable). I used also some white ones on myself for a week 7*24. They still wreck me a lot (not herx). A funny observation was that a new remote (@100khz) somehow (don’t ask me why) almost compensates for the “bad” effects of one or two white remotes (@1khz). It felt so friendly that I even decided to test it with a test virus. No pain no gain right?, but it only took less than 14 cycles. Anywayz I wish you and your friends and family the best new year and best wishes for all. And for myself I hope to grow above a medium spooky user and treat ppl more optimized and with more confidence. I hope to learn some optimization from experience sharing.